If you are using Internet Explorer as your default browser then you should also consider using Maxthon. Maxthon is a web browser based on Internet Explorer engine. So whatever works in IE will also most likely work in Maxthon. Maxthon can be thought as Internet Explorer with some advanced features. The homepage of Maxthon says that it is about 200% faster than Google Chrome. When I used Maxthon, I also felt that Maxthon is far faster than the default Internet Explorer and can be compared with the speed of Google Chrome. Now Maxthon also has a feature to backup all the browser settings including favorites and history on Maxthon servers. You can always synchronize settings and your data on multiple computers using Maxthon cloud servers. By default the sync feature of Maxthon is disabled. You can enable it from Menu by logging into your Maxthon passport account. Magic fill is a convenient feature that almost every popular browser comes in by default. Magic fill can securely remember the usersnames and passwords and other text fields so that whenever you visit the page again, the forms will be prefilled with data with just one click. You can click the Magic fill button in order to fill the forms automatically. Now Maxthon comes with different skins like Firefox. So now you will be able to change the look and feel of your browser instantly. Using the skins feature of Maxthon is very easy. Just clicking on the T-shirt button on the right upper corner of the browser will let you change the skins instantly. 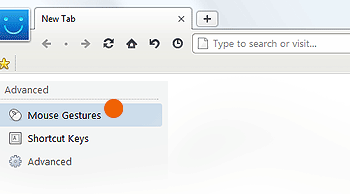 I love the mouse gestures feature of Opera. Now this feature has come to the latest version of Maxthon. Now actions like back, forward, reload will be accessible without the buttons. You can use mouse gestures for these commands and the commands will be performed instantly. You can fully customize different commands for mouse gestures. To enable and customize mouse gestures, go to Menu –> Options –> Mouse Gesture. Note: You may also want to download and install Maxthon 3.2.0.1 portable.